There were many mistakes made in people’s RRSPs when the market was crashing in 2008, and it is crucial that we don’t make them again, now that 2016 has started of so poorly. The stock market can be more about emotions than economics, and you can make bigger mistakes by going by your gut than with your head. Going with the herd and selling in times like this is never the right decision. A herd of buffalo is known for going over cliffs all together and a simple right turn can avoid that headache. Below I’ve made a game plan for the two biggest demographics. Boomers need to secure their gains and Millennials need to buy more when opportunities show themselves–the complete opposite of what happened in 2008. Many investors who were close to retirement in 2008 blew up their portfolios in overly risky stocks and then sold at the worse time. When you are getting close to your retirement, look to preserve your capital vs. making even more. There are many products out there that can serve your risk profile, and being smart with your money will save you from the doom and gloom of 2008 and let you enjoy your golden years. Annuities – a guaranteed income for a set period of time or for the rest of your life. This is a great way to reduce your stress, knowing that a chunk of money will pay you forever. Bond ETFs – There are some very affordable bond ETFs that charge you as little as a .12% fee to secure some money against stock market drops. Interest rates are super low right now, so saving on fees can get you some more bang for your yield. Dividend Stocks – Dividends make up for 70% of the stock market returns over history. Buy them and live off of the yield, whether they go up or go down. If you are saving for retirement, make sure you have automatic savings that are going to buy stocks as they go up and back down for the long run (dollar cost averaging). Corrections, like the one we are having right now, are times when millennials need to buy up cheap, good quality stocks for the long run. Automate your retirement savings now and treat it like rent or your mortgage payment. Buy dividend stocks and let their dividends pay you while you wait for the market to go back up. Don’t skip it! Get involved and buy stocks or funds you understand and see a big future in. You are a savvy person; buy things that you like and use everyday. Buy what you know with the help of a great advisor. Work with an advisor when you are young to understand the market and products like robo-advisors that might meet your values and saving goals. Buying low and then selling high is the name of the game. Buying throughout your accumulation years can start now and in time the market has always moved up. Being nervous about the market and staying out of it is the worst decision for a happy retirement. 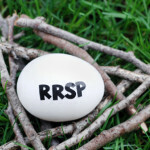 Learn from the 2008 mistakes and treat your RRSP with more care this year.